Considering Getting Dental Implants in Boston? Get the 411! Let’s explore more about dental implants, what the procedure is like, and how you can truly benefit from the most natural tooth replacement available. Dental implants don’t only restore the missing teeth in your smile, but they can restore your confidence, too! You can replace multiple teeth depending on your level of tooth loss—even replacing full arches of teeth with implant-retained dentures. You and your dentist can work together to discover which restoration is best for your amount of tooth loss. With the developments we have made today, dental implants look and act like natural teeth. Your dentist can replace both the root (a critical part of your tooth below the gum line) and the crown (what others see when you smile) of missing teeth. The actual dental implant is a tiny titanium post that mimics the root of your tooth. This helps to restore the health and function of your jawbone by replacing both your tooth roots and the visible portions of your smile. Titanium is a metal that is biocompatible, meaning that your body can adjust to it in no time with a process called osseointegration. 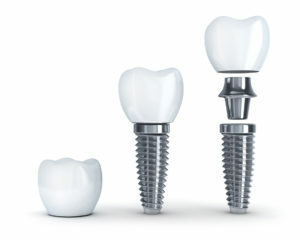 The first step to getting your dental implants would be to meet with an implant dentist in Boston. Your dentist must first determine whether your jawbone is strong enough to anchor your dental prosthetic. Once you have come to the conclusion that dental implants are the right choice for you, the first phase includes the surgical placement of your implant posts within your jawbone. You don’t have to worry about a painful or unpleasant oral surgery process. Your Dentists will use local anesthetic along with sedatives and pain medication for after your surgery to make each procedure as positive as possible. After your implants have been placed, your jawbone and gums will naturally fuse to your implant during a healing period. Once your body has adjusted to essentially your new teeth, you will return to our office to attach the prosthetic teeth. Simple! Does the possibility of having a full, healthy smile again excite you? Imagine eating, speaking, and smiling confidently—it’s possible with dental implants! Our dental team is made up of compassionate, gentle dentists that have extensive experience and education, especially when it comes to tooth loss. You can be assured that our knowledge is surpassed only by our desire to provide you excellent dental services that will change your life for the better. Are you ready to schedule a consultation? Call us at (617) 846-1811. Comments Off on Considering Getting Dental Implants in Boston? Get the 411!